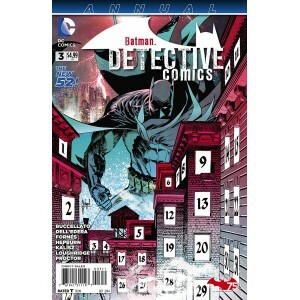 Accueil>DC COMICS>BATMAN DETECTIVE COMICS ANNUAL 3. DC RELAUNCH (NEW 52). BATMAN DETECTIVE COMICS ANNUAL 3. DC RELAUNCH (NEW 52). Written by: Brian Buccelato and Francis Manapul. Follow the movements of a deadly stash of Icarus through Gotham City. As it impacts the lives of those it comes into contact with: Elena and Annette Aguila, Harvey Bullock, and even Batman!